The dinosaurs are back, and they’re taking over the SoHo Playhouse. 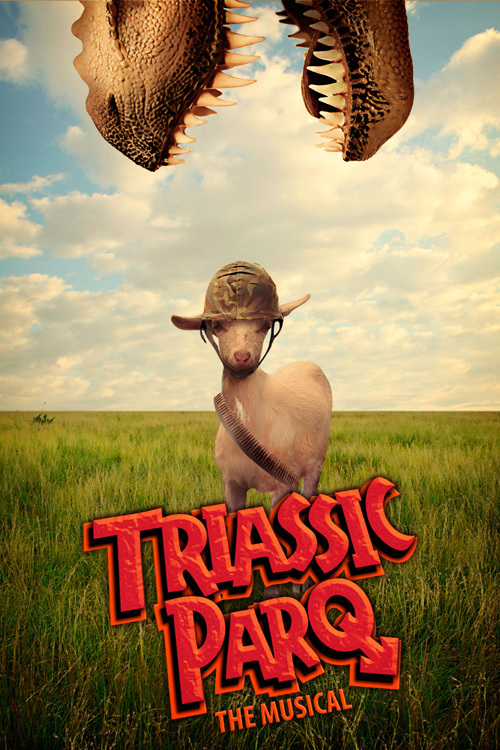 A 2010 New York International Fringe Festival hit, Triassic Parq the Musical (previously titled Jurassic Parq) will rule Off-Broadway this summer with a limited engagement currently scheduled from June 12 to August 5. I attended the original Fringe Festival run with some trepidation. Given my longstanding affection for the book and movie Jurassic Park, I was intrigued. But I also worried that a parody musical version of it might be underwhelming. Parody is not exactly my favorite form. I usually only enjoy it at all if it’s making fun of something I either really love or really hate, and even then it has to have a lot of wit and creativity to win me over. Fortunately, the creators of Triassic Parq wrote a really silly, clever, and just plain delightful show that turned out to have higher aspirations than mere parody. Rather than simply poking fun at Jurassic Park‘s well-known story of a small group of visitors trying to survive when a genetically-engineered dinosaur theme park turns deadly, Triassic Parq isolates a small plot point from the source material and creates a brand new story out of it. And this one is from the dinosaurs’ point of view. The plot point in question is the fact that all the dinosaurs in Jurassic Park are engineered female to prevent “unauthorized breeding” — however, despite this precaution, “life finds a way” and one turns male, enabling breeding. Focusing on the social implications of such an event, Triassic Parq presents us with an all-female dinosaur paradise, where the lady ‘saurs live in peace and happiness. Until, you know, one of them turns into a guy. Naturally, chaos ensues. Triassic Parq is no big-budget spectacular, but it’s a funny, tuneful take on a famous blockbuster. If you’ve ever wondered what got all those dinosaurs in Jurassic Park into such a tizzy, Triassic Parq has the answers. Get tickets here.